In case you live under a rock, Christmas is just over a month away [yikes]. My parents are coming over for Christmas dinner which means there will be seven of us at this years festive feast. Woolworths always have a great range of Gold products round Christmas time. Last year I was addicted to the gold covered champagne truffles, I’m not going to tell you how many boxes of those I polished off. Actually I also had my fair share of the Gold Desert Chocolate Selections Woolworths had last year, in particular a salted caramel one. I’ve noticed they have brought back the salted caramels in their own pack this year – woot woot!. Back again this year is the hugely popular Turducken. I haven’t cooked my own Turducken yet (only sampled a sneaky bit at a Woolies function), but this may be the year to cook one up for the Christmas dinner? I am spoilt for choice though with the great range Woolies have available. Here is a selection of delicious goodies for the Christmas table. Woolworths Gold Turducken $19.99/kg – an enticing hand rolled trio meat combination, infused to provide a succulent eating experience, complemented with a fig and Pistachio stuffing core, topped with a bacon lattice and garnished with fresh Rosemary for a unique premium roast. Decadent and affordable Puddings – Gold Ultimate Christmas Pudding (with Courvoisier Cognac) $35.00 (pictured above) and also available the popular Hidden Cherry Christmas Pudding. 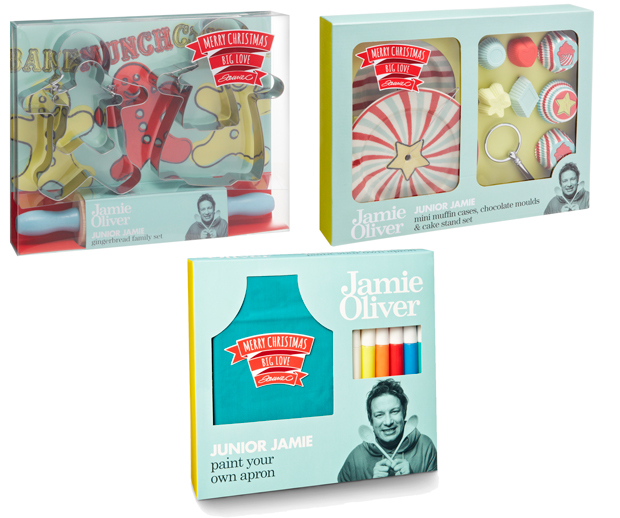 And it’s not just yummy food, Woolies have a great range of Jamie Oliver gifts for everyone. 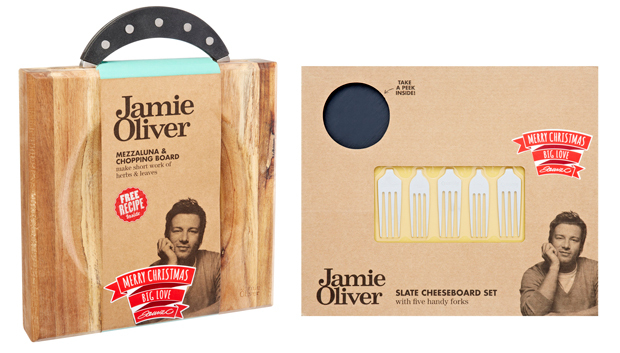 For the big kids we have – Jamie Oliver Mezzaluna & Chopping Board $25 (left) & Jamie Oliver Slate Cheeseboard Set $20. Just so you know: this post is not sponsored. I received absolutely nothing (product or cash) to write this post. I just genuinely like both the Woolworths Gold range (especially around Christmas) and the Jamie Oliver range. I’m sure if you try it you will agree.